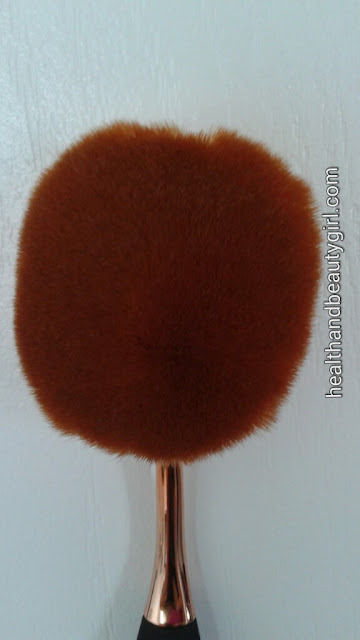 I have heard so much about the Artis makeup brushes and would have loved to try one, but at such a heavy price tag for a makeup brush, I wasn't willing to spend that much money for one makeup brush. I heard about possible dupes and did some research. I ended up purchasing one on Amazon that is supposed to be a dupe. Obviously, since I don't own the Artis brush, I won't be able to confirm whether it is a dupe or not. But, it was still fun trying it out! The brush I purchased is equivalent to the Artis Oval 8 based on its size. I find that this brush is SUPER soft and very dense. It feels like good quality and has not shed one single hair. The handle is a little weak, so I hold it closer to the brush which feels more natural anyways. I don't wear foundation, only BB creams. I have experimented with different BB creams and techniques trying to master using this brush to apply my BB cream. I have found that circular motions with very gentle pressure works best with some of my products while other ones work better with gentle downward motions. Sometimes, I find it drags the product around my face a bit, so I find using less product helps.The brush doesn't seem to absorb a lot of the product which is good. I also find that it thins out my BB cream, making my coverage lighter- not so happy about that aspect. 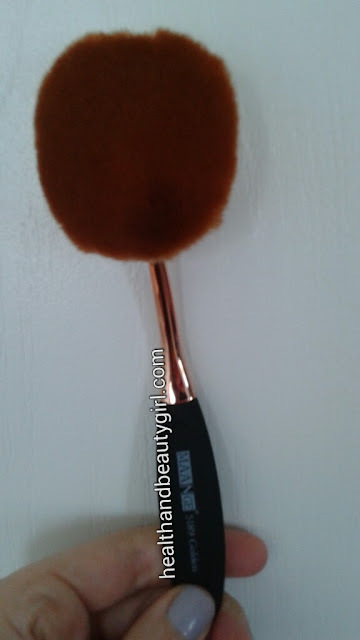 However, the brush is super easy to use and allows me to apply my BB cream very quickly which I really appreciate and it doesn't leave streaks. After washing the brush it takes a long time to dry, 1.5- 2 days as there are so many bristles! 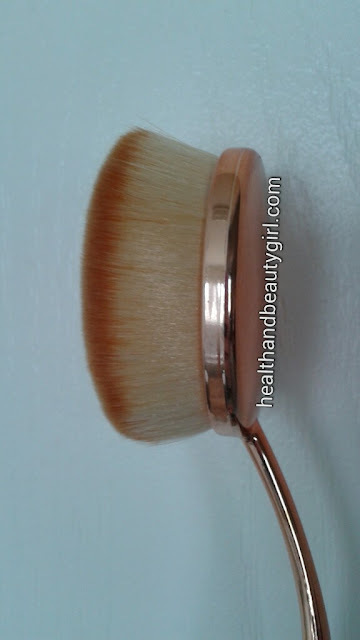 This brush has 5-star reviews on Amazon and many say it is indeed a dupe for the Artis foundation brush. Although it's very quick and easy, I find it a bit more work than I'd expect based on the fact that this is supposed to perform like a $65USD brush. Just for fun, I want to give one TWO of these away! Maybe one of you guys can figure out the best technique and let me know! Or, maybe it's just better with foundation over thicker BB creams. I haven't tried it with a foundation yet. This giveaway is only open to my readers that have a Canadian or USA shipping address, as the product will be shipped directly from Amazon.ca or Amazon.com (sorry to my international readers!) Keep in mind that shipping took a few weeks to get to me, so it will probably be the same for the winner of this giveaway. Must be 18 + years of age or have parental permission. Item may appear different than what is pictured, depending on availability. The only mandatory entry is to leave a comment on this post and enter using the rafflecopter form below. Giveaway will run for one week. Good luck, everyone! *** UPDATE: There will be 2 winners, get your entries in! I had never heard of this brush until now. I have a Beautyblender but this may be better. I've never tried a Beauty Blender! I use the Beautyblender or my fingers! I've yet to try a beauty blender. I use a sponge, which is not good. Sometimes I just don't want to use my fingers, but it probably gives the best application of BB creams. hehe.. good luck in the contest! Oh, I want to enter as I have heard so much great about these. Would love to try it out. Thank you for the giveaway! Good luck in the giveaway, Grieta! 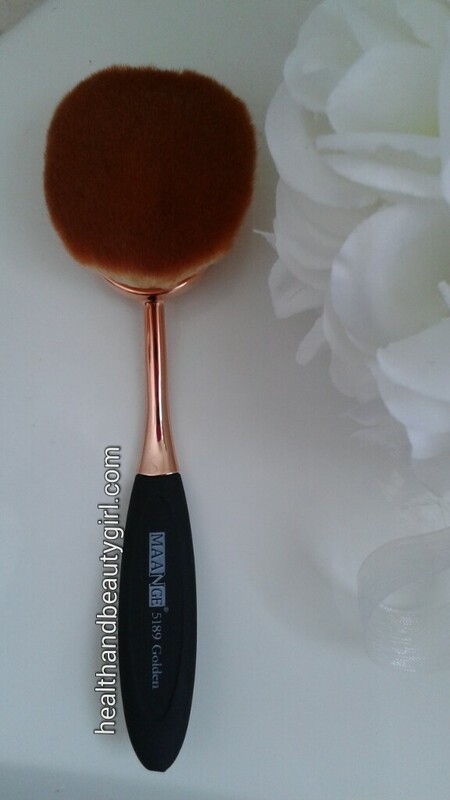 i have just started using a foundation brush; previously I just used my fingers - I like the brush better! Good luck in the giveaway, Jemrah! I've never tried this type of product before. A dupe is perfect! I love a good dupe too! Good luck, Judy! I love to use my real techniques foundation brush to apply my foundation. Gives me a flawless look to my skin. Thanks for sharing, Christina. good luck in the giveaway! I've yet to try a BB blender.. too expensive for a sponge, imo. Good luck, Julie! I just use the classic triangle makeup sponges you can buy in rectangles at target, it seems amateur but they're cheap and do the job for me, sometimes better than beauty blenders! I use those too. I just wish they were bigger! Good luck, Zoe! I use my fingers mostly. I tried the beauty blender, but wasn't a fan of it. Thanks for entering Sara, Good luck! I've been loving using a Beauty Blender lately. I love the finish it gives. Thanks for sharing, Julie. Good luck! Thanks for sharing, Shannon. Good luck!! thanks for sharing, Maria. Good luck! I use a beauty blender currently! I need to try one someday. Good luck, Nicole! I just recently bought my first foundation brush. I had been using my fingertips. I like to use a beauty blender. Thanks for sharing, Jacky. Good luck! That's never good. Good luck! Thanks for sharing. Good luck, Rhonda! I used a brush before but then switched to a beauty blender. Usually I use my fingers and then sprinkle a few drops of water and blend again. But I'm not exactly confident in my makeup skills so I'd love to experiment with this! I've been using my fingertips! I usually use just my fingers. I currently use a sponge, however I would love to give these brushes a try!! !